Heat the ghee in a pressure cooker. Add the crushed cardamoms and soaked rice. Stir fry for 5-6 minutes. Add the sugar and stir at intervals. Allow it to just start caramelizing (check pic below) so that we get a lovely buff colored kheer.Add 1/3 cup water, half of the milk and cashews to the cooker. Close lid and cook for 3-4 whistles. Remove from flame. Open the lid as soon as the steam escapes. Use a heavy spoon to whisk the contents and try to break down the rice grains( Else use a good quality hand blender for this step). We need to do this when the mixture is very hot so be careful not to splash any liquid onto ones hands. Add the remaining milk to the pressure cooker along with 1/4 cup water. Close lid and cook for another 2-3 whistles. Remove from flame. Allow steam to escape. Open the lid and put it back on the flame. Add the crumbled khoya ( i used store bought one), condensed milk, raisins and cardamom. 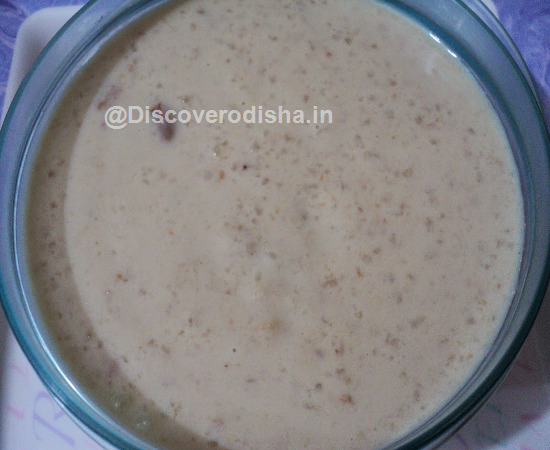 Stir continuously till the khoya dissolves and mixture reaches desired thickness. (Took 7-8 mins for me) Switch off the flame.